"Macromolecules" provides a broad survey of the entire subject; integrated representations of chemistry, physics, and technology; precise descriptions and definitions of basic phenomena; and balanced treatments of facts and theory. The book series thus intends to bridge the gap between introductory textbooks and the highly specialized texts and monographs that cover only part of polymer science and technology. Volume I is concerned with the fundamentals of chemical structure and principles of synthesis of macromolecules: constitution, configuration, conformation, polymerization equilibria, polymerization mechanisms (ionic, coordination, free-radical, step reactions, including solid-state and biochemical polymerizations), polymer reactions, and strategies for defined polymer architectures. Volume II discusses individual polymers and their industrial syntheses, Volume III the fundamentals of physical structures and properties, and Volume IV the processing and application of polymers as plastics, fibers, elastomers, thickeners, etc. The world of macromolecules in a nutshell. Hans-Georg Elias was born in 1928. He studied at the Technical University of Hanover, Germany, and received his Ph.D. at the Technical University of Munich in 1957. After habilitation at the Swiss Federal Institute of Technology (Zurich) in 1961, he was appointed Senior Lecturer and later a professor of organic-chemical technology. In 1971, he became founding president and professor of Polymer Science at the Michigan Molecular Institute (MMI) in Midland, Michigan. During these years, he also worked as consultant to the polymer industry in Germany, Switzerland, and the United States and expert witness to companies and the court. He was an in-house consultant at The Dow Chemical Co., Midland (MI) (1983/84) and an independent consultant between 1985 and 1993. He continues to teach occasionally at MMI. Professor Elias has published more than 200 scientific and technical papers and two patents on the synthesis, characterization, structure, properties, and application of synthetic and biological polymers. His ten authored or edited books have been published in English, French, German, and/or Russian, one of these, a 4-volume work, in six editions. He has lectured on invitation in fifteen countries and was a member of editorial boards of five polymer journals. "...it seems fair to say that the publication of a comprehensive and broad survey of polymer science was long overdue. The first volume of 'Macromolecules' fills this gap. More than that it is a truly impressive start to an encyclopaedia of macromolecular science. (...) This organization will prove to be excellent for readers who are already acquainted with polymer science and expect a comprehensive overview of different aspects of the topic. ...In summary, Macromolecules (Volume 1) by Hans-Georg Elias is the first of a series of long awaited, extensive handbooks on macromolecular science in the English language. The series has all the attributes that will quickly make it an essential part of the library of every student and scientist who deals with polymers. So ... I suggest reading this one." 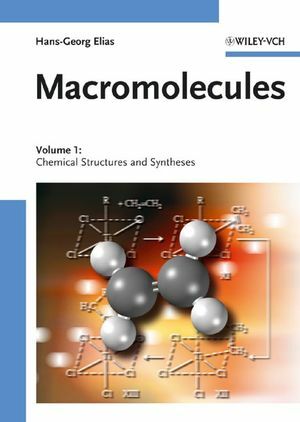 "In fact, despite the identical title 'Macromolecules' this newest edition is really a new book. (...) This volume also has a remarkable subject index featuring about 2,000 entries where a quick reference to most of the topics covered by the text can easily be found. ... a quote written by Francis Bacon: "Some books are to be tasted, others to be swallowed, and some to be chewed and digested". The Hans-Georg Elias' book belongs to the third group since it is filled with so many facts and examples that it requires some time to drift through. The first English edition proves itself through its comprehensiveness and can be recommended to all those who are dealing with polymers, independant whether they are newcomers or expert players in this field of science. Next to its substantial content its well-done layout and design by WILEY-VCH must be accentuated. So, quality in contents and form justify the best wishes for a widespread circulation of this remarkable work." "..this book is a clear must that should be located on bookshelves in all laboratories engaged in polymer research."